Coaxial cable has always been the mainstay of high speed communications, being supplanted by twisted pair wiring primarily by cost considerations. 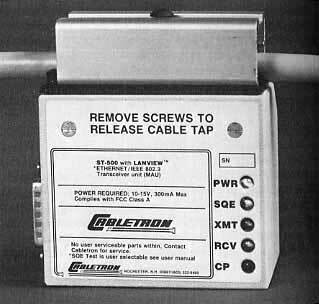 Coax was used for the cabling of the first computer networks, ARCnet and Ethernet for it's bandwidth capability, until UTP with balanced transmission techniques was developed and fiber optic options became available. Today, most video, both CATV (community antenna TV) and CCTV (closed circuit TV) are carried inside premises over coax, although much surveillance CCTV is over fiber at longer distances and some is now carried on UTP cabling using adapters. Coax has also returned to networking for use with 10 gigabit links in data centers (10Gbase-CX4) because of low cost for short (<10m) links and for residential networks using CATV cable. Coax is not included in TIA-568 but is included in other standards for data centers and residential networks. 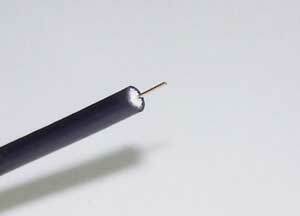 Design of coax cable gives it the high bandwidth capability. The center conductor carries the signal down the middle of the cable, held in place and insulated by a plastic dielectric. 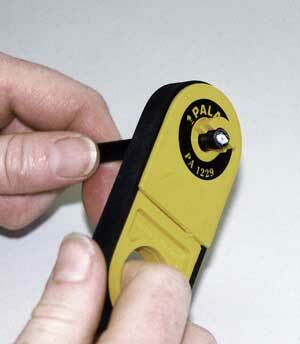 The outer conductor is the signal ground and acts as a shield to contain the signal inside the cable. Signal leakage is big problem in CATV where the high frequency signals can cause interference in many electronic devices. A coax signal is a simple modulated voltage, allowing simpler transceivers than UTP where signal processing is needed to remove problems like crosstalk and reflections. The cable has a characteristic impedance, usually 50 or 75 ohms, so transmitters must be selected to be appropriate to the characteristics of the coax cable being used. 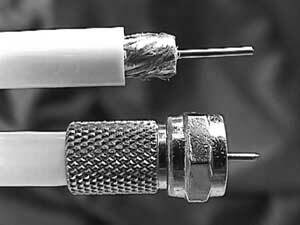 There have been a number of types of coax cables developed over the history of electronics and communications. Most are referred to by the designation "RG" which stands for "Radio Guide," an old American military term from the name of the book, and a number, which was the number of the page in the standards book on which specifications were written. Here are some of the more common cables currently in use. Early computer networks used 50 ohm coax, both regular Ethernet (Thicknet, standardized as 10Gbase-5) which used a special version of RG-8 and ThinNet on RG-58 (also called "cheapernet" and standardized as 10Gbase-2.) RG in RG-8, by the way, stands for "Radio Grade" and remains the way most people refer to coax, although "Series-6" is the preferred term today. Thicknet used type "N" connectors and a clamp-on "tap" to connect devices to the cable with an interface converter, while cheapernet used BNC connectors and BNC tees for connections. Computer networking has not abandoned coax. The standards for data center environment recognizes the use of coaxial cables for specific types of circuits. The coaxial cables recognized are 75-ohm cables using BNC connectors. The 10 gigabit Ethernet has a standard using coax, 10Gbase-CX4, using a multiple coax cable and standard connector shown below which is also used for storage networks in the Infiniband standard. Video uses 75 ohm cable. 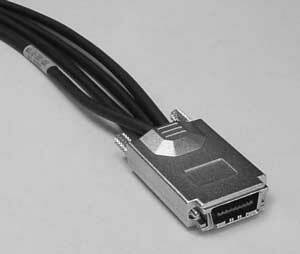 Most CCTV video uses either the BNC connector and RG-59 cable or a "F" connector with RG-6 (shown below) as is used for CATV and satellite TV. The F connector is inexpensive and easy to install since the cable center conductor is hard and can be used as the center pin of the connector. Trivia: the center conductor of the RG-6 CATV cable is made of steel coated in copper. The higher conductivity of copper is not needed, since the high frequency of TV signals (~100 MHz) causes the signal to remain on the surface of the conductor, called the “skin effect.” Satellite TV however uses the center conductor for power and needs the lower resistance of an all-copper conductor, plus it uses higher frequency cable. 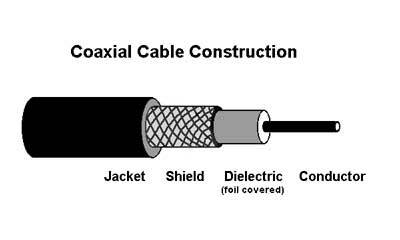 Coax cables can be installed in a similar manner and in similar locations to other copper and fiber optic cables. Coax is pulled in conduit, laid in cable trays above the ceiling or under the floor or lashed to hooks like other communications cables. Like all cables, coax cables need to be installed carefully, as overstressing by pulling by too much tension or kinking the cable can cause transmission problems. Likewise, after installation, it should not be crushed by heavy weights being placed on it. 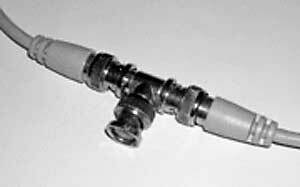 Alternate: Screw-on connectors can be used but are not generally recommended as they are prone to signal leakage. 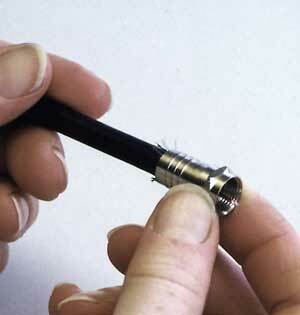 The cable is stripped then the connector is screwed onto the cable with a screwdriver-like device or T-handle. BNC connectors require a center pin to be crimped or soldered to the center conductor of the cable after stripping but before sliding the connector on the cable. 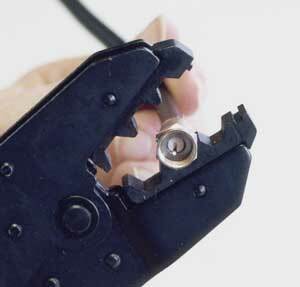 Stripping coax for termination is a 2 step process that requires a special coax cable stripper. Many types of coax strippers are available. Most use adjustable blades for the two cuts, as this cut is done deeply, while the second cut is much shallower.Some like the one shown below strips to different depts from each side while others strip differently depending on the direction of rotation around the cable. Fold the braided shield back over the jacket to contact the connector body. The “pin” formed by the center conductor is visible. The foam dielectric in the cable holds the center conductor/pin in place. Push the connector on the cable to the proper depth, where the pin should protrude slightly. Opens: no contact on connector shell, the braid did not get crimped to the shell properly. Shorts: braid wire contacts center conductor. Stray wires from the braid may get twisted around the center conductor, shorting the cable. Check closely for all braid wires before putting the connector on. Kinking of coax cable sometimes causes uneven frequency response, especially at higher frequencies, which can only be found with sophisticated frequency test equipment. Severe kinks require replacement of the cable.